Mr. Andrew Bell focuses his practice on medical malpractice defense. He has experience in all phases of the civil litigation processes at both the state and federal levels. He handles all aspects of pleadings, written discovery and motions. In addition to civil litigation, Mr. Bell has extensive experience in medicolegal discovery and deposing physicians. Mr. Bell has argued several successful motions for summary judgment and motions to dismiss, and secured over $2.3 million in settlements and awards. 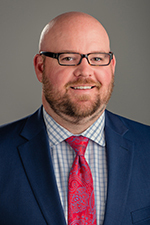 Prior to joining Hinshaw & Culbertson LLP in May of 2017, Mr. Bell practiced for five years at the headquarters of a broad service law firm in Peoria. In this role, Mr. Bell assisted clients within the areas of insurance coverage, first party property/arson, complex tort and casualty, transportation litigation and wrongful death. Additionally, he tried cases to jury verdict in both state and federal courts. Previously, Mr. Bell was an attorney with a Peoria-based personal injury firm where he concentrated his practice on workers' compensation, medical malpractice, premises liability, and general casualty cases. During law school, he served as a mentor to incoming students at Saint Louis University School of Law. He focused his studies on business transactional skills and taxation and received a certificate in labor and employment law. Mr. Bell also received an M.B.A. from Bradley University's Foster College of Business with a concentration in management. Bird v. Hospital: McLean County, Jury Trial (2018) – Represented hospital system regarding medical malpractice claims brought against ER physician and ER nursing staff. Patient presented with abdominal pain and history of constipation. The patient was discharged a few minutes after midnight. While at home, the patient passed out and returned to the ER again via ambulance at about 6am. It was discovered that the patient’s bowel had perforated and he was taken for emergency surgery. He died two days later from overwhelming sepsis. Claims were brought against the hospital for apparent agency of the ER physician, institutional negligence, and professional negligence of the nursing staff. Plaintiff’s counsel asked for $4.1 to $7.2 million for the wrongful death and survival act claims. The jury deliberated about an hour and a half before returning a not guilty verdict. Joos v. Ragon: Tazewell County, Jury Trial (2018) – Our client pulled out from a stop sign and T-boned the Plaintiff who was driving about 45 mph on a preferential roadway. Plaintiff claimed that the accident led to a knee injury which required surgery. Further, Plaintiff claimed that the knee injury prohibited from returning to work as a bricklayer. At trial, plaintiff's counsel asked for $89,000 plus non-economic damages. At trial, the court entered directed verdict with respect to liability. We argued there was no proximate cause and the jury agreed entering a not guilty verdict in our client's favor. Watson v. Dr. A: Vermillion County, Jury Trial (2017) – Represented ER physician in medical malpractice suit alleging failure to diagnose slipped capital femoral epiphysis in pediatric patient. We defended matter and provided expert testimony that physician met the standard of care. Plaintiff's counsel asked for $3.5 million. The jury deliberated for about 40 minutes before returning a not-guilty verdict. B v. Insurance Company: Circuit Court of Tazewell County, Illinois (2017) – Plaintiffs failed to timely pay their premium and suffered a fire loss destroying their dwelling. Following the loss, the insureds paid their premiums in full and argued that the insurer had consented to this practice in the past. Further, the insureds argued that the insurer had waived any requirement to timely pay premiums. Successfully argued summary judgment granted in favor of the insurer. Z v. Insurance Company: Circuit Court of Peoria County, Illinois (2016) – Obtained summary judgment on behalf of insurer in an insurance coverage case involving a claim for water damage caused by a frozen, burst pipe in a rental property. Goodman v. Leathers: Circuit Court of McLean County, Illinois – Plaintiff, a police officer for the City of Bloomington, was rear ended while investigating another auto accident and sustained injuries to his low back that eventually required surgery. As a result of the surgery, Plaintiff was forced to take a disability pension as he could not return to being a patrol officer. The claimed medical specials were in excess of $100,000 and claimed lost wages were in excess of $700,000, well above the $500,000 in policy limits. After a failed mediation wherein the mediator recommended a $300,000 settlement, the case was settled for $175,000. Banks v. Deputy: Jury Trial, Central District of Illinois (2015) – Represented a county sheriff deputy at trial in which the plaintiff claimed that the deputy violated his Fourth Amendment rights by using excessive force in the application of a Taser and by failing to intervene when other officers used excessive force. The day before trial, the co-defendant city police officers settled out of the case. After full trial on the merits against the deputy, the jury returned a verdict in favor of the deputy on both counts. Travelers Indemnity Co. v. Mr. and Mrs. John Doe: Circuit Court of McLean County, Illinois – The insureds owned a century old, three story brick warehouse which plaintiffs claimed was improperly maintained. The warehouse collapsed onto an adjacent commercial structure which housed an optical laboratory. Two laboratory employees were trapped inside the building for a period of time and the highly sensitive optical manufacturing equipment was damaged. Seven claimants demanded damages in excess of $8,000,000. The matter was successfully mediated on 7/23/14 for less than 20% of the aggregate demand. Higgins v. BNSF: US Central District of Illinois, 12 CV 3072, 2014 WL 2598815 – Plaintiff filed a complaint alleging that his osteoarthritic knee was caused by working as a laborer and machinist for over 34 years with the railroad. The railroad moved for summary judgment arguing that there was no evidence of negligence, that it was unforeseeable that the work would result in a degenerated knee, and that Plaintiff had failed to prove, even under the relaxed standards of the FELA, a causal relationship between the work and the knee degeneration. The Court granted Defendant's motion for summary judgment finding that Plaintiff failed to provide any genuine issue of material fact with respect to causation, foreseeability, and negligence. Rashid v. BNSF: (2014) – Represented BNSF in a Warren County, Illinois FELA case. Because of an aggressive defense of the case, Plaintiff filed a motion to dismiss his claims against the railroad. The railroad obtained a stipulation for dismissal with prejudice from plaintiff, resulting in no payment by the railroad on the case. Hammond v. System Transport, Inc.: 942 F.Supp.2d 867 (C.D. Ill. 2013) – Rural intersection accident involving post-impact fire. Double fatality with admitted liability. Prior to trial, court ruled that evidence of any negligent acts leading up to the accident were irrelevant. However, the manner of death was within the scope of damages allowable for grief, sorrow and mental suffering under the Illinois Wrongful Death Act. Despite no evidence suggesting either decedent survived the impact, plaintiffs' counsel argued various facts regarding the subsequent fire was relevant. Manczur v. Beachlers: 12 SC 593, Jury Trial, Peoria County – Plaintiff alleged a breach of contract following automotive repairs by our client. Plaintiff claimed that the repairs were defective and took her vehicle to another shop that made further repairs. Plaintiff's vehicle overheated after the subsequent repairs and Plaintiff claimed that her vehicle was totaled as a result of the repairs not being done properly by our client. Experts testified for, and supported, both sides. Plaintiff asked the jury for property damage in the range of $5,000 to $6,700. The jury rendered a verdict for the plaintiff only in the amount of $500, a third of the pre-trial offer, and one-tenth or less of the demand. Reeder v. Auto Owners Ins. Co.: 2016 IL App (3d) 150252-U – Obtained summary judgment in favor of Auto Owners in a case where plaintiffs claimed they were entitled to coverage under an insurance policy issued to the prior owner of car. The Third District Appellate Court affirmed the trial court's order, holding that following the sale of the car, the prior owners had no insurable interest in the vehicle. In addition, the court found that the omnibus clause of the policy could not be interpreted as offering coverage to the purchasers of the car. and Mrs. C. v. Insurance Company: Circuit Court of Peoria County, Illinois – Insurer denied the insured's claim for a fire asserting that it was intentionally set by plaintiffs and that plaintiffs made material misrepresentations during the investigation. A second fire occurred and the insurer denied this claim as the policy was void following the fraud from the first fire. The Court granted a motion to dismiss regarding the first fire on statute of limitations. Thereafter, a second motion to dismiss was granted disposing of the claim for the second fire and bad faith claims. M. v. Insurance Company: Circuit Court of McLean County, Illinois – Plaintiff's vehicle was repossessed. Plaintiff claimed that the vehicle was unlawfully repossessed and filed suit against her insurer seeking coverage under the theft provision of her auto insurance. Our motion to dismiss the frivolous claim was granted.